Update: Finnish tech site Puhelinvertailu released specs that match the previously leaked specs we've listed below. But here's a few new nuggets we noticed about the Nokia 625: the large 4.7-inch screen is LCD, the 5-megapixel camera has 1080p recording capabilities and there will be microSD support for up to 64GB with 8GB of internal memory already on board - or so the report claims. Five different colors are said to be available - orange, bright green, yellow, white and black - with interchangeable semi-transparent shells. The site also claims the Lumia 625 will have an LTE variant with support for European bands - and probably North American support a little bit later. It seems like Nokia has its work cut out for itself. Right after tweeting there would be "something big" revealed tomorrow, notorious leak artist @evleaks struck back with its own set of tweets. We already speculated that the Nokia 625 would be the prime topic of discussion and it seems @evleaks agrees. The Twitter account posted not one, not two, but three images of brightly stacked phones, with two pictures containing phones noticeably sporting "6:25" as the time. The suspicious time shown in the image may seem like a far stretch but leaks of the Nexus 7 2 have taken a similar route in attempting to convey Android 4.3. Though, the incessant amount of images of the purported Lumia 625 seem to strongly suggest this may not be a coincidence. 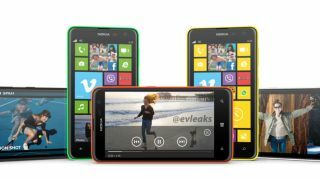 TechRadar has previously reported that the Lumia 625 will likely pack a 1.2GHz dual-core processor, 512MB of RAM, 5MP rear camera and front facing VGA. At this point, however, guessing is really just a countdown until tomorrow, at which point Nokia will let us know what's really going on. Well, we know the Lumia 625 won't cost as much as the Ubuntu Edge's crowdfunding goal.